They’re here! 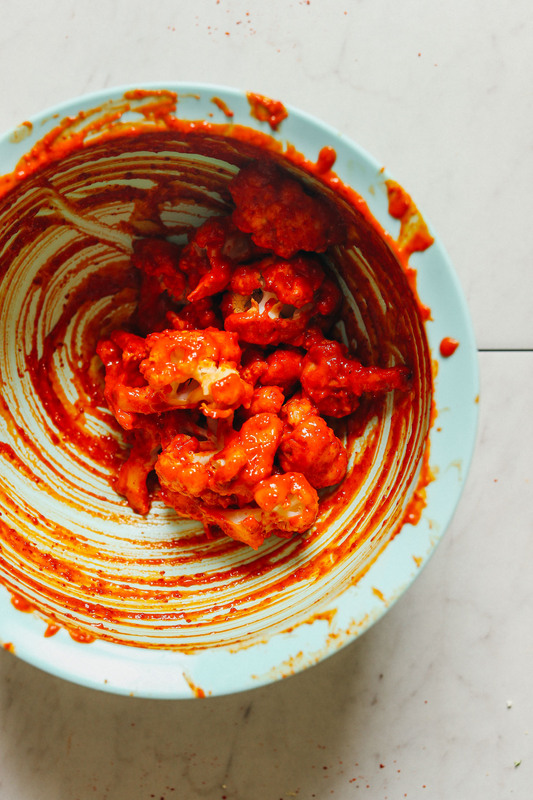 The tastiest cauliflower wings on the block using our Korean-Inspired Gochujang Sauce. Let’s do this! This recipe is easy, requiring 30 minutes and 8 ingredients to make. It’s also nut-free, soy-free, and oil-free optional. It all starts with a head of cauliflower roasted until just tender. While that’s happening, make your sauce. 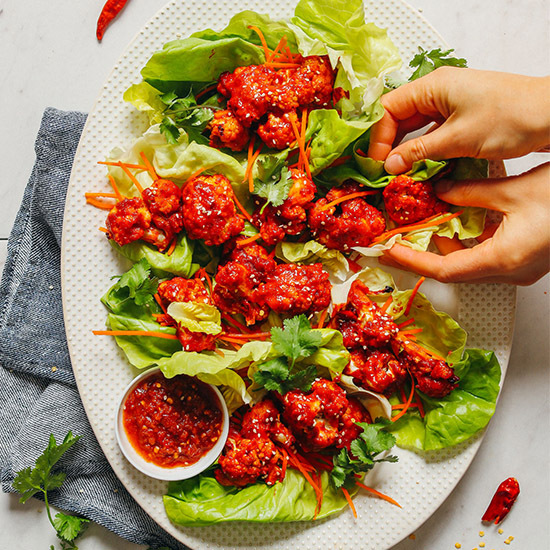 This sauce utilizes the Korean Gochujang Sauce we made earlier in the week, mixed with chili garlic sauce for more heat, coconut aminos for saltiness and depth of flavor, and maple syrup for a bit of sweetness to balance the spice. This sauce is finger-lickin’ good. After another short roast in the oven, these wings are ready to devour! Enjoy as is or serve in lettuce cups with garnishes of choice. These would make the perfect appetizer, side, or snack when you’re craving some comfort food. Not only are they delicious on their own or in lettuce cups, but they would also be delicious atop rice bowls or salads! 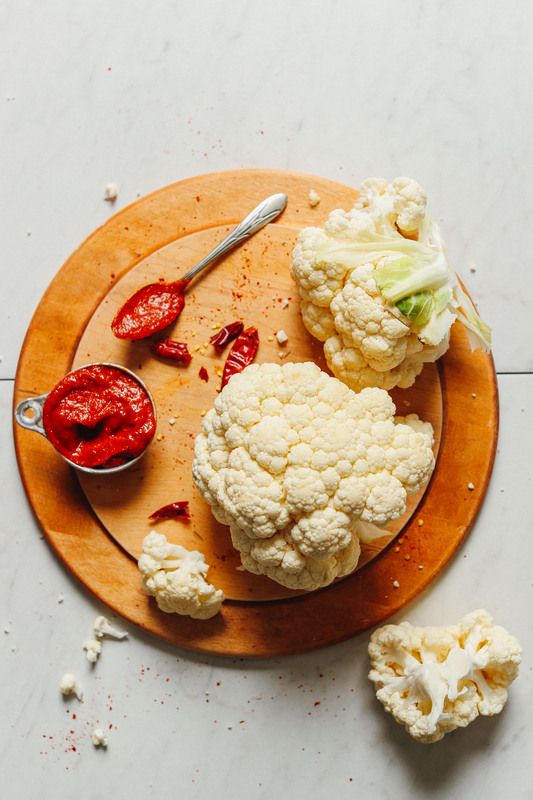 Be sure to check out our other cauliflower recipes like Spicy Red Curry Cauliflower Wings, Roasted Cauliflower Tacos with Chipotle Romesco, 30-Minute Sweet Potato Cauliflower Curry, Shawarma Roasted Cauliflower Steak, and 30-Minute Cauliflower Rice Stir-Fry. 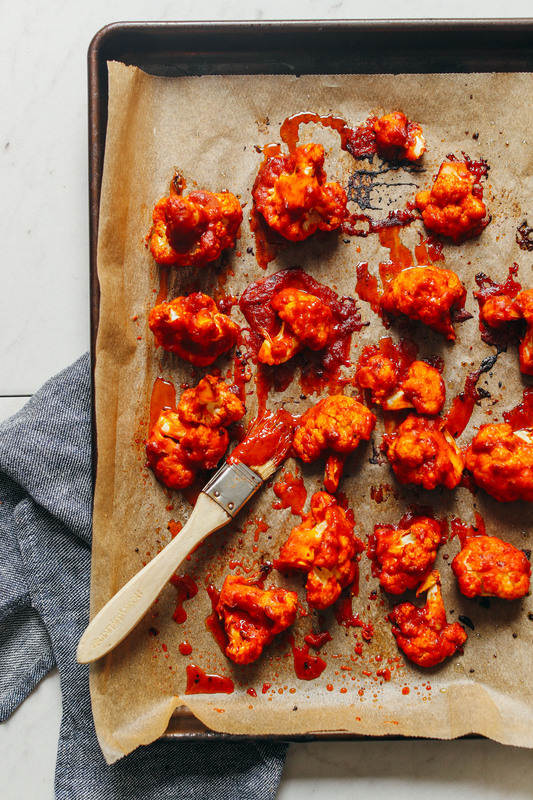 Amazingly flavorful 8-ingredient, 30-minute cauliflower wings! Seasoned with Korean gochujang sauce and baked until tender. A flavorful appetizer or side dish that's also soy- and nut-free! Preheat oven to 450 F (232 C) and line one large or two small baking sheets with parchment paper or a silicone baking sheet (like this one). Use more baking sheets as needed. Add cauliflower to a large mixing bowl and toss with oil to coat. Then arrange on baking sheet(s) and roast for 10 minutes. In the meantime, prepare sauce. 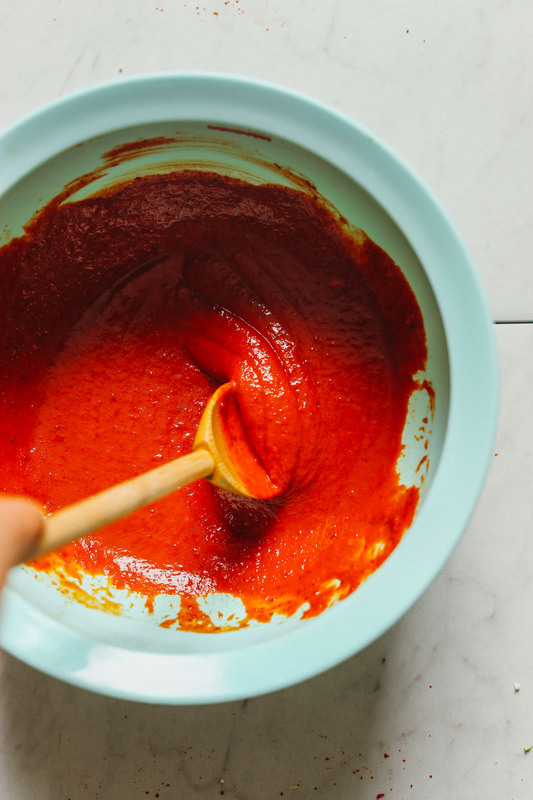 To the same mixing bowl from earlier, add gochujang sauce, sesame oil (or water), coconut aminos, maple syrup, sea salt, and chili garlic sauce. Whisk to combine. Then taste and adjust flavor as needed. Add more chili garlic sauce for spice, coconut aminos for depth of flavor (“umami”), maple syrup for sweetness, or salt for saltiness. Remove cauliflower from oven and increase heat to 500 degrees F (260 C). Add a few “wings” at a time to the sauce. Toss to coat generously, tap off excess, and then place back on baking sheet. Coat all wings. Then return to oven and bake for 10-13 minutes more or until sizzling, golden brown on the edges, and tender (but not mushy). While baking, prepare any additional serving elements, such as grated carrots, lettuce cups, or fresh garlic optional. Serve immediately. Best when fresh. The wings can be refrigerated up to 3 days, or frozen (either at the glazed stage or the glazed and baked stage) up to 1 month and then reheated on the stovetop or in a 350-degree F (176 C) oven until warmed through. *Nutrition information is a rough estimate calculated without the oil and additional sides (lettuce cups, cilantro, etc.). *Prep time does not reflect items prepped while other items are cooking. I can’t wait to try this. Do you think I could whip up a large batch of the sauce and then portion it and freeze till I’m ready for to make them? Do you think this would this stand up to being baked the first time, packed up to take to to a party, and then tossed in sauce and finished in the oven at the hosts house? I would love to take this to a get togther but don’t want to hog the oven. I think that should work, though we haven’t tried doing it ourselves. Let us know how it goes if you give it a try though! Sorry to hear this recipe didn’t work out for you! Did you happen to change anything? Let us know and we’ll do our best to help out! Loved the sauce recipe, but i found that I wasn’t able to get the cauliflower wings as crispy as I normally like… I’m thinking I sauced them too early…because once they’re sauced, I found I couldn’t roast them too long without the sauce burning. Hmm that may have been the case! Now you know for next time, right? Thanks for the review, Shelby! LOVE these! 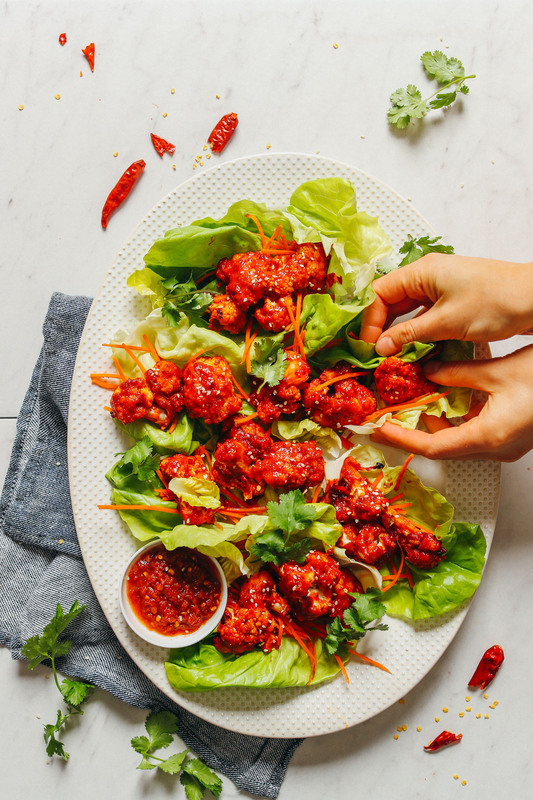 If you are wondering if these wings are worth it going out of your way and find Gochujang sauce – THEY ARE! I omitted the chili garlic sauce and they were *plenty* spicy (I used Roland brand Gochujang). I served them in warmed corn tortillas with a quick broccoli slaw (shredded broccoli, brussel sprouts, carrots + lime juice, cilantro, olive oil, s&p). Best meal of the month! Easy, delicious recipe that my hubby and I loved. 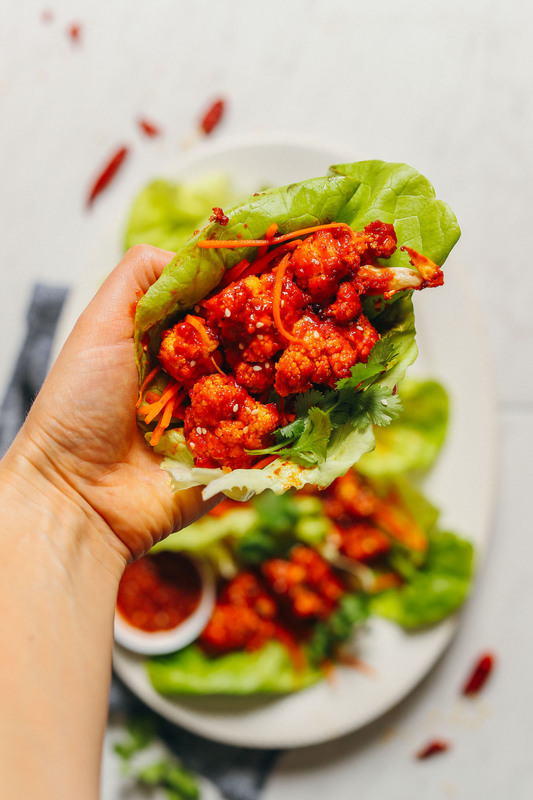 We had the cauliflower wings in lettuce wraps as suggested, along with sesame seeds, shredded carrot, coriander, and green onion. Show stopper. Will definitely go well with rice and fresh veg/herbs next time. Delicious. Now part of my rotation. Missed these flavors. This was really easy and delicious! Holy cow, I made this last night and it was a hit with both myself and my fiancé! I doubled the recipe out of the gates because I had a feeling we’d want leftovers, and I was right. xD we also have plenty of sauce leftover to use on other things for the next few days! Definitely a winner! This cauliflower dish is really good. I put the raw caulifower in a ziplock bag, added the sauce, shook to coat, and baked until just tender. I like spicy and this was the perfect spicy. Thank you! I made these the other night, and they turned out great! I breaded the cauliflower in panko, of course (because I’m a glutton). This is going in my recipe book. Even the little kids in my household liked this (I made it a bit less spicy for their palates and prayed they’d eat more than one bite). If you are questioning whether the (relatively minimal, but I’m pretty lazy) effort is worth it – don’t! Just make these and make a double batch of the sauce because it’s finger lickin’ good! Like you will actually lick your fingers and then fight for the leftovers. Just finished making and eating this. I spun them like lettuce wraps at PF Chang’s, adding rice to the wrap and a chili soy sauce dipping sauce. My lips are a bit ? but I like that lol. I made my the gochujang sauce; I think I added too much water, it was a bit runny (noted for next time). Great recipe. I have loved every single one of your recipes I’ve tried! Glad to hear it, Danielle! Yes, for future you can always add less water and this should yield a thicker sauce! The recipe sounded really good but I am going to have to make adjustments because it was too spicy to eat when made as written. I do want to try it again with a bit less spice. I found the sauce to be delicious but too thin — do you know how I could thicken it up? I used water as a substitute in the sauce instead of sesame/avocado oil, soys sauce instead of coconut aminos, store-bought gochujang sauce and didn’t use any additional water to thin the sauce out. Hi Merilla! Next time, skip the water altogether and add more gochujang to thicken. Hope this helps! could i substitute honey for maple syrup? This recipe is SO GOOD. I added a bit of rice vinegar to the gochujang sauce to cut the salt/heat with a bit of acidity and it was perfect for my tastes. But with cilantro and some carrots, it really was such a filling, flavorful and simple dish. Will def be making this again (and as a non-vegan, am lowkey considering using this sauce for ribs in the near future). Yay! Glad to hear you enjoyed it, Julia! Always the BEST vegan recipes. Always accurate and beyond delicious! Oh my goodness!! These are amazing! So much flavor! Dana you’ve done it again! Definitely making these again! Sounds so good, I am going to make these soon! The sauce would also be wonderful marinade for tofu! We made these for dinner last night. Easy and quick to put together and the cauliflower was packed with tons of flavor thanks to the amazing Korean sauce! Hearty, “meaty” and will be a great summer BBQ option! Another fantastic recipe! Made this to have during some lunches this week. I didn’t make the sauce from scratch and the store bought brand (Bibigo, I believe) was crazy spicy… for me, anyway. Next time I make it, I probably won’t cut it with water. I think I’d prefer a thicker sauce to stick to the cauliflower. I just made these for dinner and they were a big hit! I served them as lettuce wraps and they were so delicious. I can’t wait to try the sauce in other applications. I served them with all the recommended additions, but also added scallions and (for a twist) diced spicy pickles that we had on hand. We tried the recipe last night. Delicious! Well, i must say this was AMAZING! It was gone in 5 minutes. Next time i will have to triple the amount. I have just one suggestion in mind, usually i replace every other oil with Coconut oiL. There’s no oven in my dorm, so I’ll steam the cauliflower instead. Is there a better oven replacement? Probably the next best thing is a toaster oven. Or an air fryer. I crisp up all sorts of veggies in mine, oil or no. I would love love love these! But I am just wondering about the nutrition of this cauliflower after being subject to such high heat such as 260 deg Celsius ? Not gonna lie, I’d eat ALL of these cauliflower wings! LOL! Probably not ideal since it would be so so spicy, which I love, but I most likely can’t tolerate all of it! I love the idea of making lettuce wraps–yummy! Just made kimchi today. Will make these tomorrow for a Korean feast. Thank you! i lovee the Korean version of this..i have cauli at home and you’ve totally inspired me to make wings tonight.